Most USPS orders placed by 11am EST and UPS orders placed by 3pm EST ship same day. Orders placed after those times normally ship next business day..
USPS priority mail(1-3 Business days-In most cases, the expected delivery date printed on your receipt or provided at checkout will reflect a delivery time of 1, 2, or 3 business days and is based on origin, destination, and drop-off time. The expected delivery date does not come with a money-back guarantee and is not a guaranteed delivery date) Only USPS Priority mail express comes with a money back guarantee. You can read about USPS priority mail HERE! 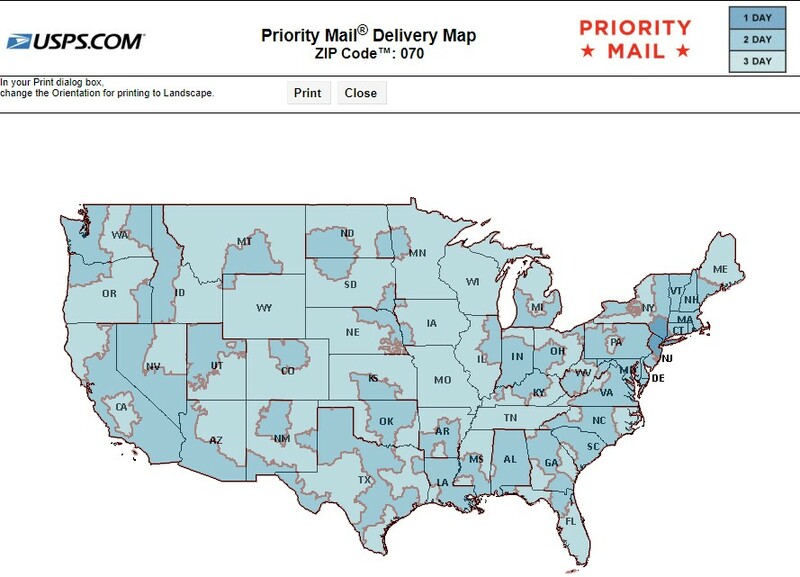 You can read about USPS priority mail express HERE! You can read about USPS priority international mail HERE! Here is a USPS approximate time in transit map. Shipping delivery times are guaranteed by the delivery company NOT BY Dieselfiltersonline.com. If you feel your package hasn't been delivered in a timely manner please contact the shipping company directly. Ground shipping is free for all orders over $250.00 being shipped to an address in the continental (lower 48 states) United States. Ground Shipping usually take 1-6 days to reach its destination. Hawaii, Alaska, APO, and International orders do not qualify for free shipping and will be giving other shipping options upon checkout. Below is a map of UPS time and transit. Orders over $250.00 being shipped to an address in the lower US 48 states will received free ground shipping. Free shipping doesn't apply to US Postal shipping. All other orders will have shipping charges calculated at the time of checkout and may chose US mail or UPS at that time. Overnight, 2-Day, and 3-Day Expedited shipping is available through UPS to any address within the United States. These shipping charges will be calculated before checkout and you will be giving the option of selecting one of these options. All orders being shipped internationally will be shipped US Postal service . Expected delivery time will be 7-10 business days from the time the order is placed, we are not responsible for delays in customs. All shipping charges will calculated and billed at the time the order is placed. We ship via US Postal service for international orders for a couple reasons. The Us Postal service handles customs better then UPS, and the shipping costs are normally much less then other shipping methods. We are NOT responsible for any customs fees or brokerage fees on international orders. If your country requires either or both, it is up to the buyer to pay those fees at time of delivery. All International orders are shipped declared value. All Sp Performance Brake Rotor orders normally ship in 2-3 business days being Sp Performance Brake Rotors are made to order.